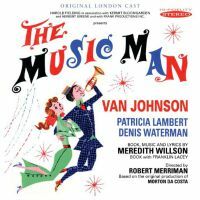 Original London Cast, 1961 (HMV/Sepia) (2 / 5) In the London production of The Music Man, Van Johnson played Harold Hill. The film star was a selling point at the box office, and he also brought a real American presence to the British cast. This recording is a fun listen, if not distinctive. Johnson’s performance is more than pleasant, and Patricia Lambert sings beautifully as Marian. A particular standout is the Winthrop, Denis Waterman. A regrettably abridged version of this album was released on a budget-priced CD by Laserlight in 1995; missing from it were “Iowa Stubborn,” “Piano Lesson,” “Sincere,” “The Sadder-but-Wiser Girl,” “My White Knight,” and “Shipoopi.” Go with the more recent Sepia CD edition, which presents the complete recording. — J.D. Film Soundtrack, 1962 (Warner Bros.) (3 / 5) Your feelings about this recording will depend on several things: Do you prefer Hollywood’s Shirley Jones to Broadway’s Barbara Cook? Do you favor the souped-up movie arrangements/orchestrations, or the stage originals? Do you think the conventional ballad “Being in Love” is an improvement over the more complex “My White Knight?” Would you rather hear Robert Preston’s Harold Hill as he sounded when the show first opened, or after he had been playing the role for a few years? Since responses to all of those questions are highly subjective, I won’t try to convince you one way or the other. Anyway, of primary importance is Preston — and on this disc, his Harold Hill is as spontaneous and irreplaceable as ever. 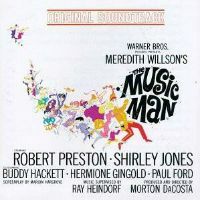 Buddy Hackett is an engaging Marcellus, Hermione Gingold makes a major impact in her few vocal moments, and Ronnie Howard is delightful as Winthrop. Pert Kelton wonderfully reprises her Broadway role as Mrs. Paroo, and The Buffalo Bills are also on hand again. — J.D. 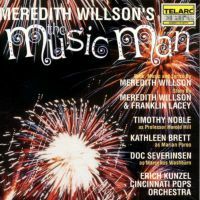 Studio Cast, 1991 (Telarc) (1 / 5)This recording features Erich Kunzel conducting the Cincinnati Pops Orchestra; it uses a mixture of the Broadway and film orchestrations of the score. Included are “My White Knight,” “Being in Love,” and Harold Hill’s version of “Gary, Indiana.” The orchestrations are credited to Don Walker (Broadway), Ray Heindorf (film), and four other gentlemen — so if the album doesn’t sound consistently theatrical, small wonder. The movie’s overture is also here, along with dance music that seems an amalgam of the stage and film versions, none of it played with much excitement. There is a huge chorus: the Indiana University Singing Hoosiers. Timothy Noble plays the title role; the notes refer to him as a leading operatic baritone, but his portrayal of Harold Hill is way off the mark. Marian is played by Kathleen Brett, a Canadian soprano who has a pure, pretty voice but does not ignite any sparks. Doc Severinsen plays Marcellus and leads “Shipoopi” with some energy, but the rest of the supporting cast is uninteresting. So, why does this recording deserve even one star? The “It’s You” ballet, previously unrecorded, is included here. Also of interest is a counterpoint version of “My White Knight” and “The Sadder-but-Wiser Girl.” — J.D. 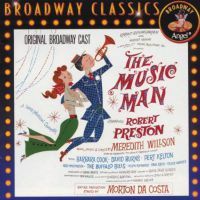 Broadway Cast, 2000 (Q Records) (1 / 5) Onstage, Craig Bierko sounded so astonishingly like Robert Preston in the title role of The Music Man that the actor’s own personality never emerged. 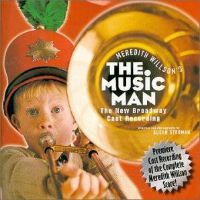 On this cast album, the similarity is great enough to be spooky; you may wonder, “Which recording did I put on?” Since any successful production or recording of this show must have a dynamic Harold Hill, Bierko is a major handicap. On the plus side, Rebecca Luker’s performances of “Goodnight, My Someone” and “My White Knight” are beautifully sung. The barbershop quartet is also fine, but adding the voices of Harold and Mrs. Paroo (Katherine McGrath) to “Gary, Indiana” barely allows Michael Phelan to register as Winthrop. Finally, while the album contains almost every bit of music that was heard in this revival, along with dialogue to add dramatic punch, the new orchestrations (by Doug Besterman) and dance arrangements (by David Crane) aren’t improvements on the originals. In fact, adding accompaniment to “Rock Island” is harmful, as the lyrics don’t fall as pungently on the ear. — J.D. 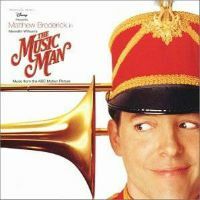 Television Film Soundtrack, 2003 (Disney) (1 / 5) The casting of Matthew Broderick as Harold Hill was controversial, to say the least. Some viewers of this TV film may have gradually fallen under Broderick’s spell and, by the final scenes, may have bought into his subtle characterization. On the soundtrack recording, however, his performances of “Trouble” and “Seventy-Six Trombones” are simply too low-key. Broderick does a little better with “The Sadder-but-Wiser Girl” and “Marian the Librarian,” but Hill’s first two songs must establish the character strongly for the show to work. On the plus side, Kristin Chenoweth’s Marian is enchanting. The supporting players are all good actors who sing well, but their vocals don’t have much éclat and often seem muted. Some of the musical changes that were made for the big-screen version of The Music Man are included here, but how nice that Chenoweth sings “My White Knight” instead of the inferior “Being in Love.” — J.D.